Ability - offering extremely durable products in a fashionable colour range. When creating products out of concrete, fashionable and durable ‘through’ pigments that withstand the test of time will enhance and let your products stand out from the rest. Cosmotron® DPU-AC is a high performance super plasticiser / plasticizing admixture which allows a substantial water reduction to be made in cement (and lime) bound mixes for a workable consistency or slump. As a result, all mechanical strengths are increased. 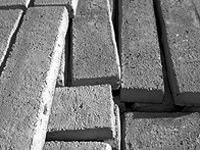 These products have been formulated to enhance, protect and strengthen many aspects of coloured concrete production - resulting in outstanding, durable colour tinting within cement products such as pavers, fountains, plant holders or anything cast in concrete as well as offering extreme durability in all applications.